There is nothing more effective than listening to someone who share from experience and the book "Organic Outreach for Families: Turning Your Home into a Lighthouse" by Kevin and Sherry Harney is just that. The couple share through their book one of the purposes of the family and that is to testify to the amazing grace of God and share the faith we have in Him in a natural way. The book focuses on the family and how it can effectively influence the community for Christ. “Organic Outreach for Families” shares the importance of parents starting to reach out inside the home by beginning with the children, then the extended family. Raising children to become lighthouses in their schools and neighborhood is also given as a way to share the gospel to others aside from the hospitality of the whole family to friends and the community. The challenge and reminder is for families to live fun but godly lives that we become attractive, welcoming and authentic so we can shine like a lighthouse in the community we live in. I recommend this book to parents and those who are thinking about starting their own family. 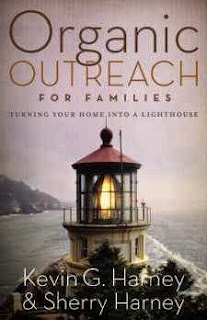 Kevin and Sherry Harney’s “Organic Outreach for Families: Turning Your Home into a Lighthouse” is a must-read for those who want to become more effective in sharing the gospel naturally.